Firefighters watch from their fire trucks as wildfires continue to burn, Oct. 12, 2017, near Calistoga, Calif.
Wildfires raging in California's wine country are "all combining into one," Napa County's fire chief said Friday as firefighters faced more dry, windy conditions and the death toll rose to 32. Fire Chief Barry Biermann said he's teaming up with the state's fire protection agency to set up containment lines in "priority spots" in order to keep the fires from spreading. He said firefighters gained some ground Friday but could face challenging conditions in the coming days as low humidity and high winds are expected to return. "Today, the weather is cooperating, but we are going to go back into red flag again," he said. "And that's going to be an issue that we will have to keep a close eye with low humidities and potentially wind for the next couple of days." Late Friday, officials announced that Governor Jerry Brown and U.S. Senators Dianne Feinstein and Kamala Harris were scheduled to tour on Saturday the destruction in Sonoma County. 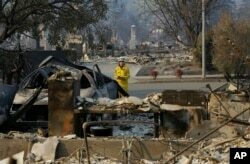 A California Fire Department forester inspects damage at homes destroyed by fires in Santa Rosa, California, Oct. 12, 2017. California Department of Forestry and Fire Protection Chief Ken Pimlott says firefighters made gains against the wildfires overnight. He said thousands of additional firefighters have poured into California in the last 24 hours, and said more than 9,000 people are fighting several major fires. The firefighters have come from other parts of California, and as far away as Canada and Australia. Pimlott said two of the biggest fires in Sonoma and Napa countries are at least 25 percent contained. All that remains of some neighborhoods are a few blackened chimneys, charred trees and burned-out cars. The fires north of San Francisco have killed 32 people since Sunday, while no one has yet heard from nearly half of the 900 people officially listed as missing. Sonoma County Sheriff Sgt. Dave Thompson says officers recovered bone fragments Friday from one person at a mobile home park that was destroyed by fire in Santa Rosa. He said there is a "high probability" they'll find more. Rescue workers are using cadaver-sniffing dogs to search for bodies, which Thompson calls "very tedious work." Sonoma County Sheriff Robert Giordano said identifying fire victims is going to be hard. "We have found bodies that are almost completely intact and we have found bodies that are nothing more than ash and bones. One of the ways we make IDs in those cases is through medical devices ... where there is a piece of metal left from somebody's surgery, like a hip replacement with an ID number on it." Pope Francis sent a telegram of condolence Friday for those who have lost loved ones to San Francisco Archbishop Salvatore Joseph Cordileone and Los Angeles Archbishop Jose Gomez. He offered his "heartfelt solidarity and his prayers for all those affected by the disaster." About 17 wildfires are burning across a region spanning more than 750 square kilometers, which includes some of northern California's world famous vineyards and wineries. At least 5,700 homes and businesses have been destroyed. The strong dry Santa Ana winds that blow down from the mountains every late summer and early fall are creating conditions that make the fires spread easily.